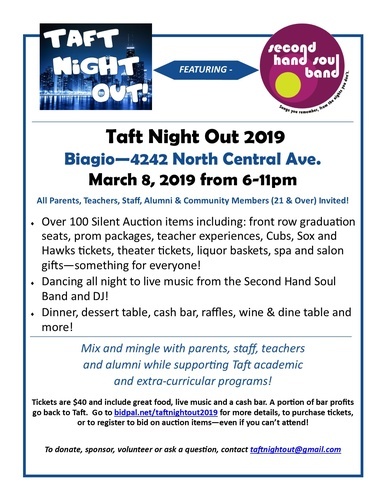 Join neighbors, friends, Taft families, staff and alumni at the 3rd annual Taft Night Out celebration. Evening includes dinner, silent auction, live music by Second Hand Soul Band, raffles, dessert table, cash bar and more. Enjoy a fun, casual night out while supporting your local CPS high school! Please contact us if you'd like to donate to the auction or become a business sponsor. Biagio Events & &Catering 4242 N. Central Ave.
Friday, March 8, 2019. 6 - 11 pm. $40 in advance/$45 at the door.